Thank you so much for the tiles Phredreeke, I was able to figure out how it was aligned. Basically arms and the bar were overlapping by one pixel so aligning the image with noise could've been very hard. I had to mimic the alignment in photoshop and drew from there. As far as I know, there need some clean ups to do but it worked so far. + I also realized... BloodGDX.jar itself is a package executable file. hahaha So I managed to implement all images I've created. I'll release the update when it's cleaned up. I am not sure if anyone has an issue when trying to get Phredreeke's upscale r07 to get working (at least I was), but for those who suffers from the same issue, I think I solved that problem. - Extracted the zip file into new folder. - Remove all def except the *.def file you have saved. - Move the zip file into autoload folder. That pretty much made the package working again. It blends nicely with my work in progress. Yeah I've been meaning to make a new version but I've been focusing on other stuff. My main focus over the last decade or so has been modelling and rendering. It's only recently that I got into 'proper' rigging and animating. Until then. I just added a very basic skeleton and animated all the standard animation cycles like I was doing claymation - moving one limb at a time. No constraints, no helper bones, no IK at all. It's only since KuriKai on the Doom modelling project decided to take up animation (and found out that he's fairly good at it) that I have also concentrated on this. I could always just get the animations I needed done in far less time than it took to research how to import the animation files into Blender and link them up with the skeleton. Also, I don't know if there are enough different existing animation files online that would look good with the models in Doom/EDuke. I had a Kinect in the house for ages, but British houses (read: 'shoeboxes') aren't made for setting up an ad-hoc mocap studio in a corner of the living room. It has been awhile after I uploaded the loading screen image... I've finally managed to finish the UI rework. To install, just extract the zip file into autoload folder. 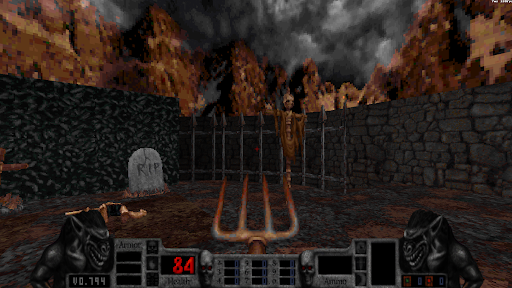 There are some optional stuff I included in zip file, such as: darker blood, brighter gun flashes, and high resolution fonts. 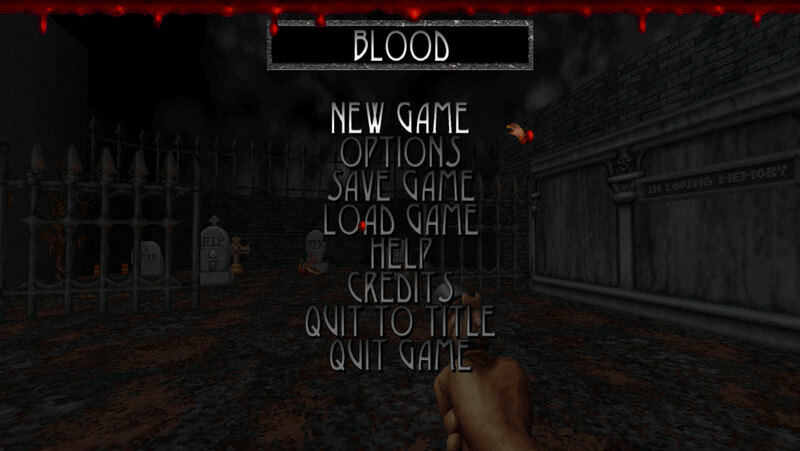 Menu is upscaled (the file includes the high resolution font, just in case you do not have one), including blood dripping in the menu. 3rd status bar UI mode is now unobtrusive. Someone should compile a pack for download with both Phredreeke's stuff and Xross stuff for convinience. I'd like to state that I'm perfectly fine with Xross using my content in his pack. My focus has been on Redneck Rampage lately and Blood has been kinda neglected. I may also opt to scale certain textures so their vertical resolution is a power of 2 such as the grandfather clock. Oops, I should've asked you if you are okay with me to use your font module into my pack. But thank you for letting me include your content in my pack! I just wanna make my work to be included as default in the future version of BloodGDX, the HD font should be a default as well. If there is anything I've missed, I will address them if need be. 4. Return to the folder where hud.def exists. 6. Cut and paste your new "hud.zip" into autoload. Well, that will be the solution for now. I may create two sets of versions in the future update if these steps are hard to follow. 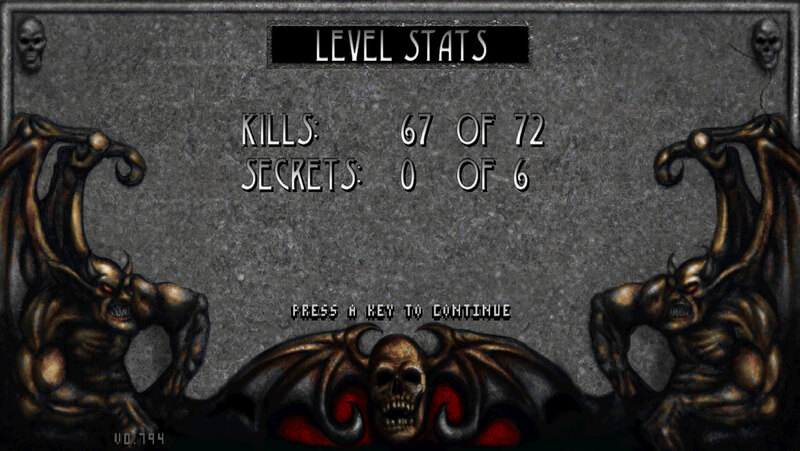 After playing around with the ESRGAN tool, I've run some of Blood's background tiles with IMO good results. A set of 400 tiles can be downloaded here. I am not providing support for actually using these in game at this time. Looks nice, did you play around with AI neural net upscaling already? Edit: Hehe, I just read it's the same. i really hope somebody make an updated, working texure pack for the latest version. I'm working on upscaling the enemies again, this time using ESRGAN instead of Waifu. Here is a work in progress version of the next release. Note: You will get errors about missing files when launching, and enemy color variants will appear their "base color" as I haven't processed those yet. Here is a work in progress version of the next release. So close to the view of the original models by Kevin Kilstrom. 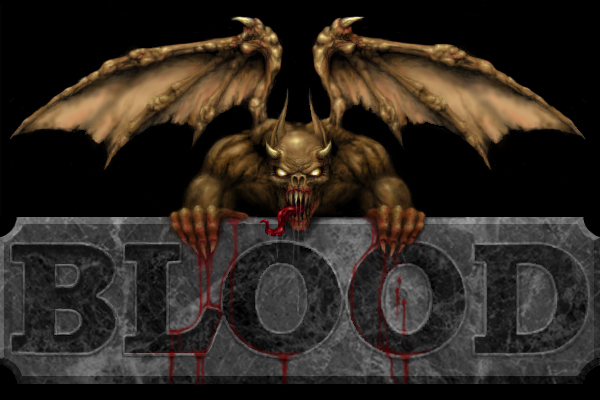 I really loved to see that high quality original Blood logo art by Kevin Kilstorm! I tried to replace some high resolution stuff in the folders, it's really hard! Sometimes it work, and sometimes not. I've been working on a new upscale pack. 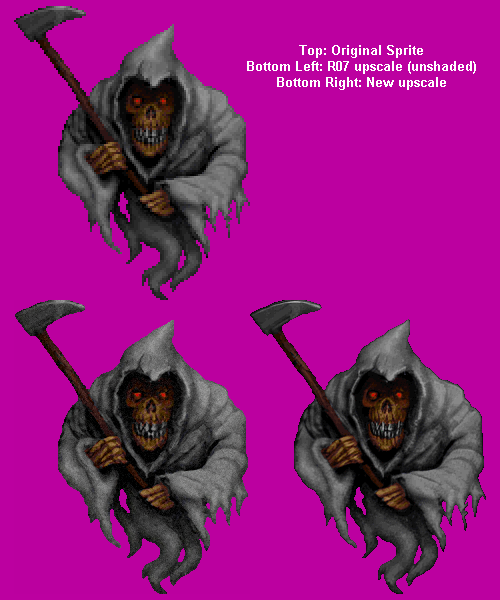 Here's a comparison of a sprite from both R07 and the new upscale. Since people have been having problems downloading upscale pack r07 I've decided to reupload it. I've also taken the opportunity to fix autoloading for both BloodGDX and NBlood. Is there a way you could please outline how this can be installed? My installation of Blood is the actual Blood directory plus the GDX required files from m210's site. I read through your info.txt file but I wasn't 100% clear. Thanks for giving the install instructions. I didn't update the info.txt to cover that, I only renamed the DEF files to autoload and added a blood.def file for NBlood. I tested some upscale options on the Blood logo art by Kevin Kilstorm. The result was good, but I wasn't very happy with it. You can take a look at yourself! If you create a free account, you can use a 30 days trial. but what are the world textures looking like? any chance at a sound remaster too?